It all starts with a simple iPad app. Available now for free, the Audi A8 app shows you how the car will look in light tan or dark blue. You will also find out that the 19-speaker stereo system was custom-designed specifically for this car. You can find out how the pedestrian detection system works. And, you can gawk at a few beauty shots of this $78,000 luxury sedan. What the app doesn’t really explain though is that the real reason the Audi is such a wunderkind of engineering is not the tech features, or the styling, or even the luxury add-ons. The car is just a blast to drive – at any speed, under any conditions. 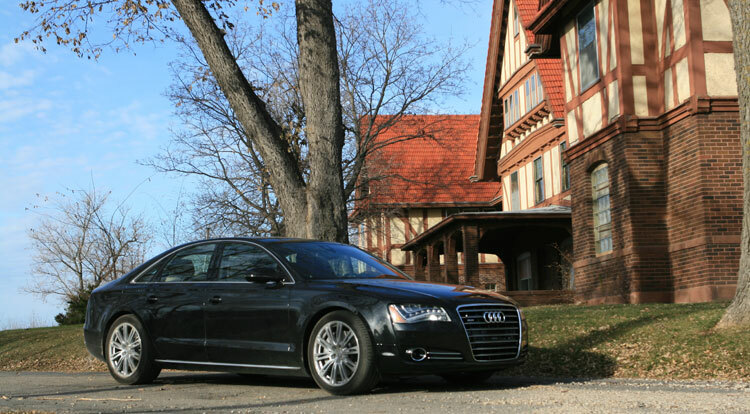 The truth is, the A8 does not seem as innovative, at least in terms of fuel efficiency and high-tech features. It might come as a surprise to learn that the Infiniti M37X we recently tested actually has more advanced safety features (well, at first glance – more on that later) such as a lane keeping system that brakes the wheels slightly to nudge you back into your lane. In terms of “green tech” the Chevy Volt is decidedly more advanced – after all, not many cars have one gas and one electric motor. 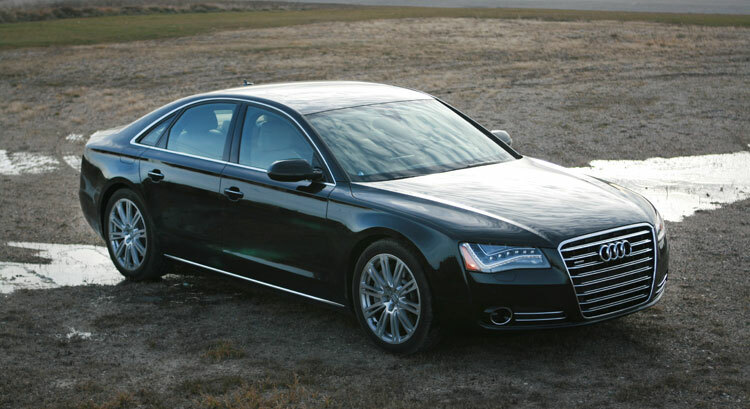 However, taken as a whole, the Audi A8 is one of the best (if not the best) production cars ever made. After a week of driving an all-black model with the extra PreSense package and a few optional accessories (such as all LED lights on the front and rear of the car that mimic sunlight), we can say that this is the vehicle you want if you crave only the best top-end luxury and high-tech features. 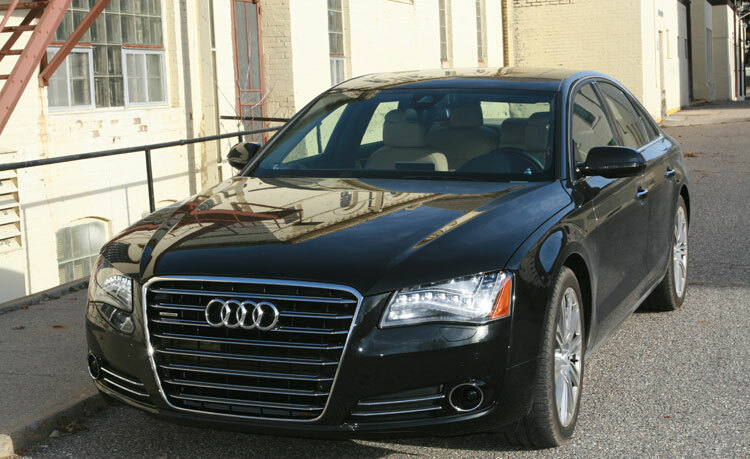 The Audi A8 retains that classic Audi look, which is to say that it’s not flashy or bulbous like a BMW 7-Series or the Infiniti M37X, but instead has a sleek and understated look and a slim side profile. It’s surprisingly sleek for a large sedan. The all-black model we drove was not really a head-turner, but we think Audi likes it that way. It is a car that is designed for luxury and sporty handling. Inside, the A8 is also not necessarily meant for extreme luxury appointments. We ended up liking the cockpit feel of the Infinity M37X better, and found that the A8 has a bit more of that Mercedes feel where you don’t necessarily feel like you are in tune with the controls. That changed quickly once we actually put the vehicle in drive, because at that point the shifting and adjustments the car makes take over and it’s a blast to accelerate into high speeds and a lot of fun to take corners. In many ways, the interior styling is also meant to be understated – it’s not flashy, but trim and professional. Now, we should mention the stereo system at this point. Designed by Bang & Olufsen, this 19-speaker system pumps out 1500 watts and you feel every note. Seriously, this is an extremely powerful, crisp, and well-tuned audio system and finally, after many months, we can say it is on par or even slightly edges out the stereo system in the BMW 740Li. (Interestingly, we found the stereo in the Jeep Grand Cherokee to be a hair louder and more bass-thumping than the A8.) When you switch the car on, the front speakers rise out of the dash; they look like tiny satellites. We played recent releases by Band of Horses, Bruce Springsteen, and a band called The Go! Team and were just blown away.